A few weeks ago Rimmel London US was nice enough to send me some samples to review! I received eleven colors from their 60 Seconds line. They retail for $1.99 each and can be found at drugstores and major retailers. Thoughts on formula: If you use two thin coats, the polish does dry pretty fast on it's own. The main issue I had, was the polish does not level off or even out properly, so it would look uneven when dry. Using a topcoat smoothed things out nicely though. They are highly pigmented. I was really hoping they would stamp, since the formula is thicker, but as you will see below they didn't perform very well for that task. All in all, these are a great deal for $1.99 each. 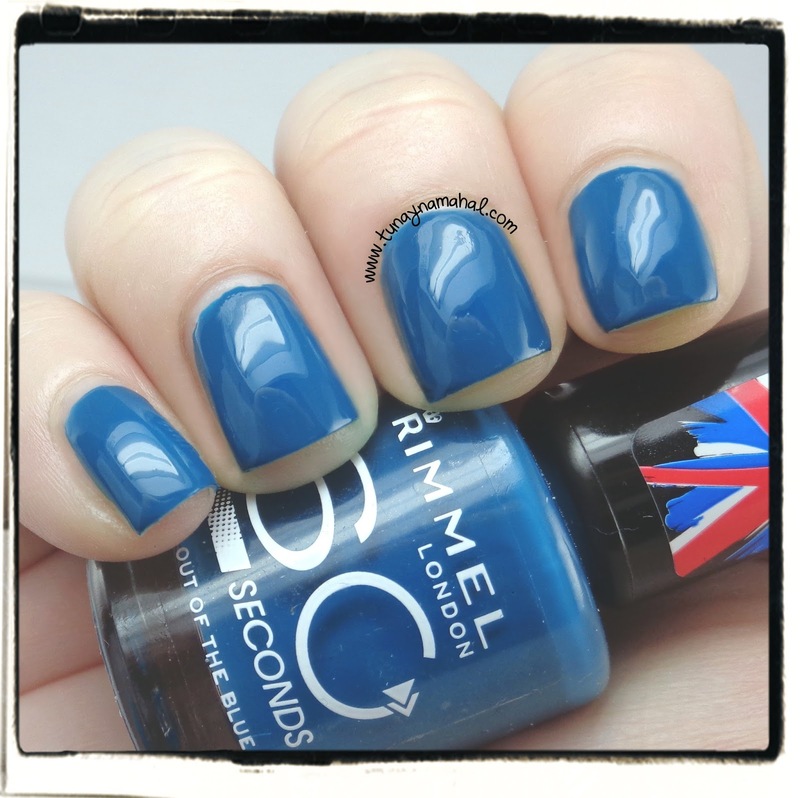 There are 42 colors in the Rimmel 60 Seconds line. Note: Most of these polishes you can get away with just two coats. But under my bright lighting I always use three coats, it's just the norm for me. 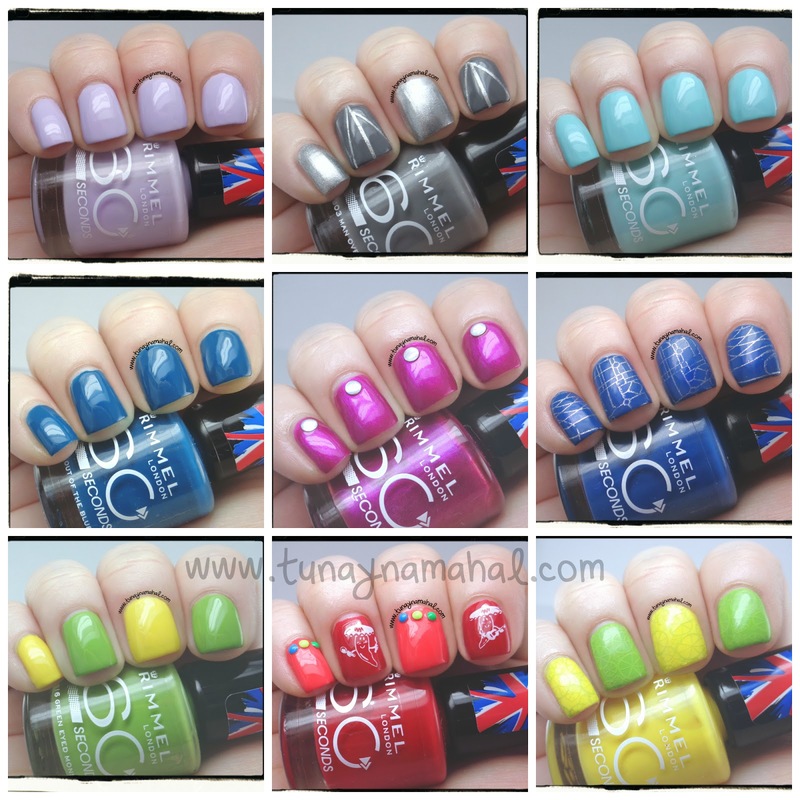 I also used Seche Vite fast dry topcoat for all swatches below. I Lilac You: Pretty pastel Lavender. I used 3 coats, plus Seche Vite topcoat. Mintilicious: Love this light minty color. 3 coats, plus Seche Vite topcoat. 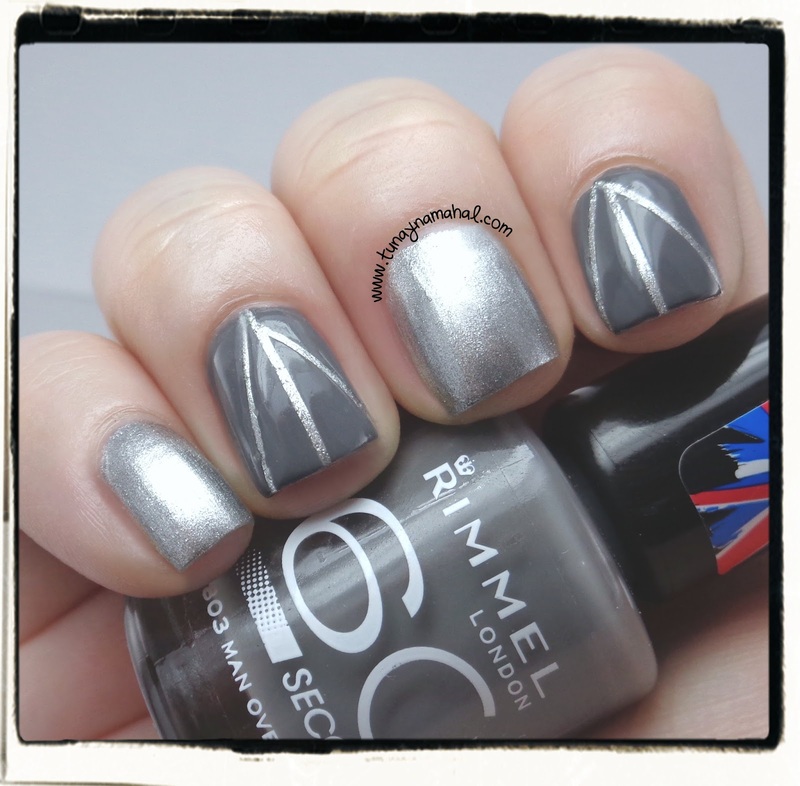 Precious Metal & Man Overboard: I decided to play with striping tape for the first time! I really love how this combo turned out. It's probably my favorite of all of them. Two coats of Precious Metal, and 2 coats of Man Overboard over the striping tape. Plus Seche Vite topcoat. Out of the Blue: I absolutely love this deep dark turquoise color. It's really rich and beautiful. I used 3 coats, plus topcoat. But... the downside is- this stains your skin very badly during cleanup & Removal. (I did not wear it long enough to say if it would stain your nail beds though.) I would still wear it again, because I don't have a turquoise quite this color. Red, Steady, Go & Hot Chili Pepper: I decided to have some fun with these colors and went with a festive chili pepper theme. I used Winstonia Store stamp plate W211. I also used neon studs from Painted Polish. Three coats each of the polish, plus Seche Vite topcoat. (The red stains your skin during cleanup and removal). 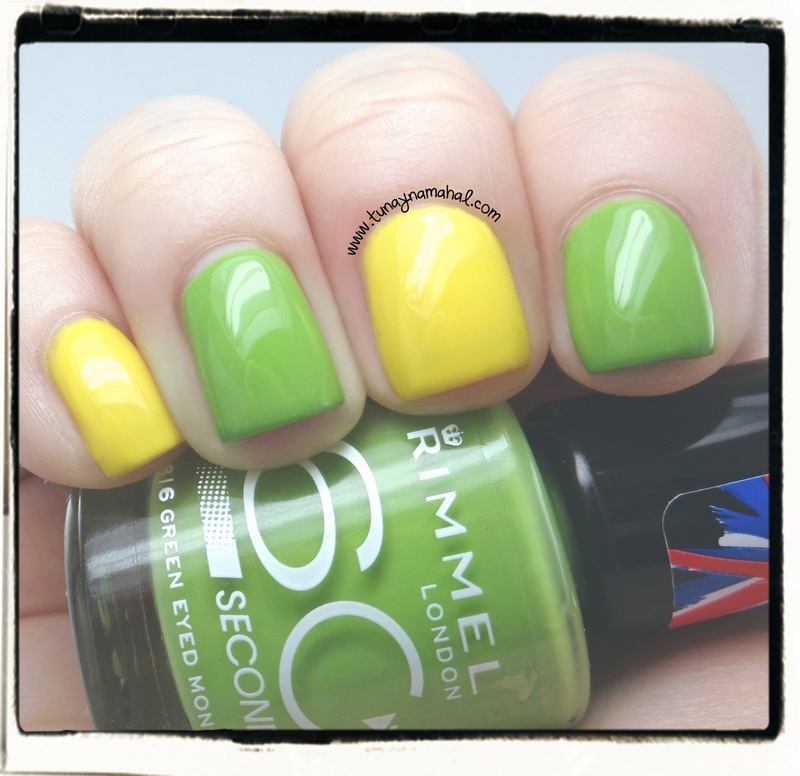 Sunny Days & Green Eyed Monster: These bright lemon & lime colors make me think of summer. I used 3 coats for each, plus Seche Vite topcoat. I found that Sunny Days was a bit thinner in formula than Green Eyed Monster. Here's where I attempted to see if some of the Rimmels would stamp. Even though they are quite pigmented on your nail and have a nice thick formula, they don't work well for stamping. They are not pigmented enough to stamp, so the designs turn out quite light. I used Winstonia Store W118 for the citrus fruit design. Blue Eyed Girl & Precious Metal: Really nice bright cobalt blue, I used 3 coats, plus topcoat. I decided to see if the silver Precious Metal would stamp. But again, it doesn't quite cut it for stamping so the design is a bit faded. I used Emily De Molly stamp plate EDM03. (Blue Eyed Girl is also a stainer during cleanup & removal). 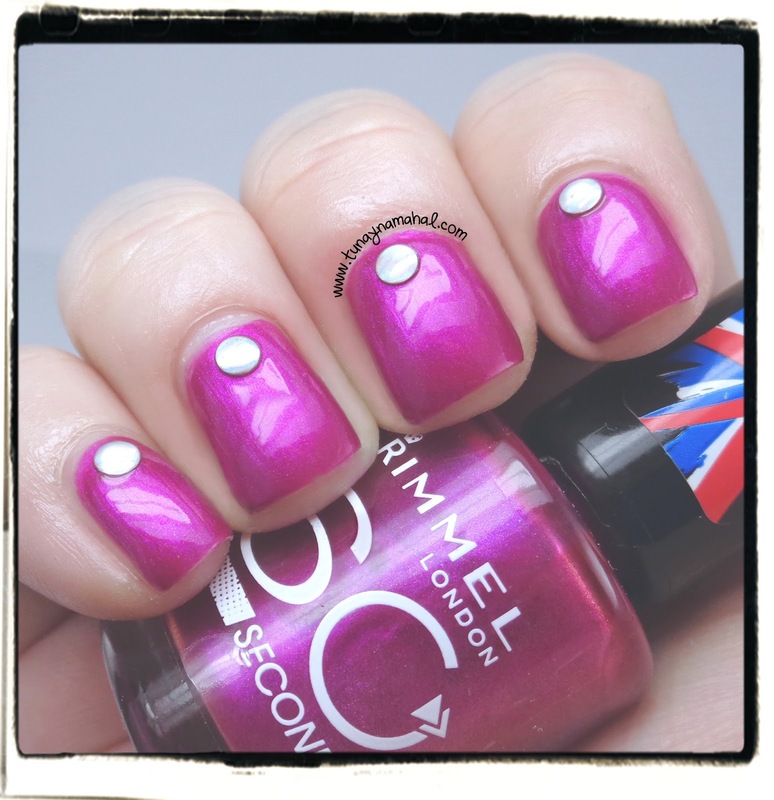 Pulsating: Bright Fuchsia with purple/blue shimmer. This formula was a bit on the thin side. I used 3 coats, plus Seche Vite topcoat and some holographic studs from Painted Polish. Don't forget you can also follow Rimmel London US on Facebook, Twitter & Instagram!